There's little extra space in Paris. Every night, out front of our hotel, the garbage trucks made a pickup. We bought food supplies at the Franprix around the corner. The back entrance to the store was just down from our hotel on our street. I noticed beggars out and about around the area around Franprix. They had cups asking for Euro coins, which was anything up to 5 Euros. Then I saw various people, including some fairly well dressed locals, going through the big plastic green trash cans put out late each afternoon. Whatever the stores needed to jettison, for whatever reason, went out in the cans each late afternoon for the nightly pickup. This obviously supplemented the diet of folks who hung out around the neighborhood. Pre-packaged sandwiches that had outdated, fruit, veges, you name it went out each day and folks shopped (dove in) the cans for leftovers. Because there's no room for dumpsters out back anywhere and no way to shield folks from garbage diving, it went on every day. 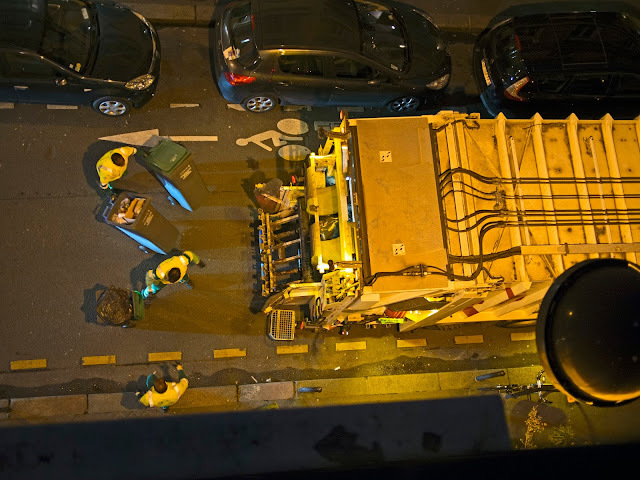 Here's a shot from our balcony of the nightly pickup. We left the balcony doors open most of the time and heard the trucks show up every night.